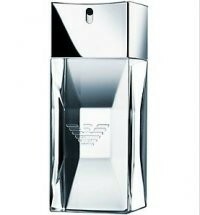 Emporio Armani Diamonds for Men in the initial aromas, the icy opening contrasts with lingering sensual, burning accents. The emblematic notes of men’s fragrance are subverted with original surprising and addictive ingredients. This sparkling duality gives birth to a play of dazzling reflections. A luminous, daringly full-bodied opening. The refined, radiant freshness of the Italian citrus-bergamot accord is enlivened by a vibrant, electric burst of Szechuan Pepper. A virile, tumultuous, impertinent heart. Cedar, the iconic embodiment of masculinity, is shaken up by the addictive and unexpected power of the deliciously familiar, intimate and alluring cocoa bean. A noble, ardent dry down. The slightly smoky gaiac wood and intense vetiver are set off by ambroxan with warm flinty accents. The interpretation of an irresistible, solid diamond. With its recessed facets along the side, the luminous square of glass plays with rays of light, reflecting them from within in infinite configurations like a modern kaleidoscope. A streamlined, powerful, faceted object. Set firmly on its base, featuring an integrated shiny metal spraycap adorned with the famous eagle emblem. The sweetness doesn't balance well with the more masculine low notes. Actually this is a good and likable fragrance but far too expensive. It's sweet but never feminine with good projection (though the longevity is more average). Definitly a change from the floral aquatics (including Armani's own Acqua di Gio) and very wearable.